It records onto SDHC cards....and yes...it does look like an HMC151 with a pair of binoculars stuck on the front. There's not much info on the lenses... they don't appear to be particularly 'pro' though housed in that lump of plastic with only the one focus ring on the main body of the camera....still, they might be really good. Now, looking at it, you're probably thinking that an HMC151 is about £3.5k so this has got to retail for somewhere in the region of maybe £7k? Maybe even £8k? No Chance. $21,000...which at the exchange rate should be about £13k, but it won't be...it'll be more like £16k or £17k. That's a lot of money for what appears to be a prosumer camcorder that's got to fit a lot of data onto SDHC cards... there's no specs on the codec or the data rate yet. It's only available to order...so no popping down to Dixons to check it out..it's going to be available in Q4 2010. I've got to wonder who's going to buy it? Surely broadcasters looking to add 3D material will build their own systems using higher spec cameras...and features will do the same.. 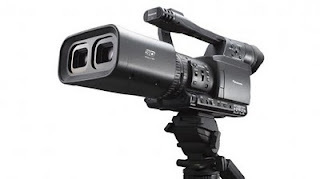 I can't see an indie film being shot on one...cos for that kind of cash you could get yourself a really tasty HD camera with a nice lens. 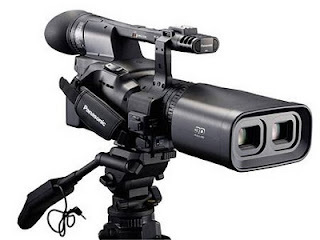 Still, good on Panasonic for pushing the boundaries... it does mean there's a way (if you want it) to basically do a run and gun style shoot in 3D now... could be interesting.